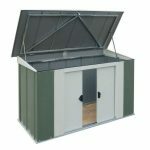 This is a premium galvanised steel shed with an apex roof which is completely fire resistant and rustproof. 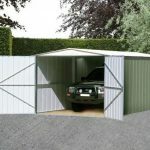 Built to last for years it has deep roll formed walls and roof panels giving it extra strength and durability. Tall wall height means you completely maximise on your space inside and there is plenty of headroom, even for the tallest gardener! For extra-long life the steel has been powder coated. The BillyOh Clifton has been built to withstand any weather and will be a staple garden building for years to come. 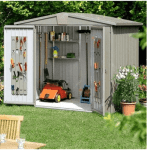 The BillyOh Clifton is a great all in one storage solution for the avid gardener. 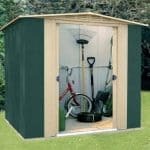 This shed is good for me because I live alone and I don’t own a lot. It is the perfect size for what I need it for. However, others may need something bigger. I only put my lawn mower, rakes and shovels, and grill in there during the summer. The doors open wide so it’s easy to put my belongings in there each year. I like it because it is metal and it does seem to hold up, even during storms. I like the sliding doors because I am older and it’s easier for me. It didn’t take much to put together and it didn’t cost as much as I thought it would. 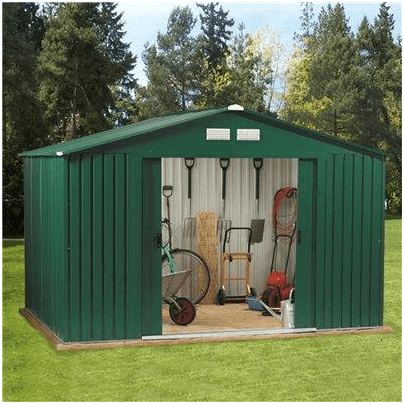 I was hesitant when it came to choosing a shed because I was so worried of something rusting. 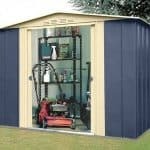 Thankfully this one is rust resistant and I don’t have to worry about that, no matter how much rain fall or how much snow I get where I live. This is as industrial as it looks. Great for a bloke but if the misses is looking for something more aesthetically appealing then you may want to go with another style. As far as the storage is concerned, I couldn’t be more pleased ! It is built well and I believe will last many years if taken care of. My lawnmowers and shovels as well as all the gardening tools and some sod, gravel and wood chip bags as well. We also noticed it being very air tight. We have no unnecessary damp to ruin our stuff or rust anything. Very pucker piece indeed! Spot on storage space and the construction is better than I have ever had. Well, pleased! I have more equipment associated with my building business than most have for gardening so i am happy to say that it holds down well. It is great for anyone in any industrial field such as myself. The price was a well worth it investment that will pay me back time and again. No regrets here.